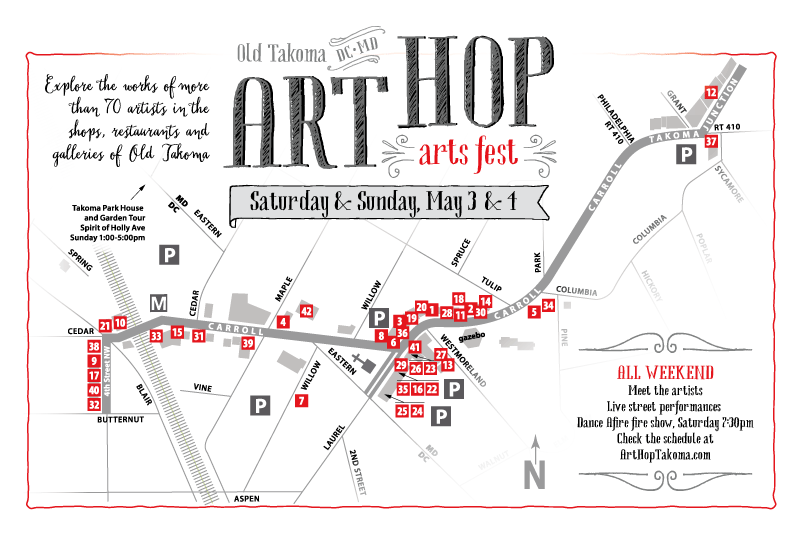 Mark your calendars for the annual Takoma Park Art Hop on April 24 - 26, from 10am to 4pm. Every year at the end of April, Takoma Park transforms itself into an arts district. This year over 70 distinguished artists from around the Capitol region will be showing and selling some of their best work in the shops, restaurants, galleries and on the streets of Takoma – from Takoma Park, MD to Takoma, DC. For more details on events, artists and transportation see Mainstreet Takoma. This year, S & A Beads is especially delighted and honored to be displaying the bead and fabric work of Dr. Sirkku M. Sky Hiltunen, known to friends and admirers as Dr. Sky. Dr. Sky is a long time customer of S & A Beads. We especially love her ability to work with rare large pieces that so many of our customers admire but don’t quite know what to do with. Her sense of color and balance is impeccable. In addition to being a great bead artist, she is an outstanding painter, set designer and clothing maker, among other gifts. In addition and most importantly, there is a spiritual side of her work, which while impossible to describe, is hard not to feel when in the presence of her work. There is another side to Dr. Sky, which while separate and apart from her jewelry line, will be of great interest to our customers. Dr. Sky is a pioneer in using art to heal wounded souls. If the field of Art Therapy had a guru, Dr. Sky would be it. Dr. Sky is one of the visionaries behind The Art and Drama Therapy Institute, a facility in northeast Washington, DC that works with intellectually disabled adults. When I visited last December, I was blown away by the vibrant intellectual and artistic buzz that permeated the place. Everybody there, staff and patients alike, was actively engaged in creating and enjoying beautiful things. Not what you would expect at a place for autistic, brain injured and other seriously disabled persons. I have been to fabulous galleries and museums, I have visited art studios and theaters, and I have spent time in facilities for severely handicapped people; but not all at once and not in the same place before. You don’t have to be a great artist to be an excellent therapist. And certainly many fine artists have little in the way of therapeutic abilities. But every once in a very long while, a great healer is also a brilliant artist. Such a person is Dr. Sky. Come see her work and meet her in person during Art Hop. We promise you: you will be inspired and delighted.